Disney is celebrating Valentine's Day this year with its Princesses. Beginning today through Friday, February 15th, select Princess apps for iOS devices are only $1.99, discounted from their regular price of $4.99. If you have a special someone who loves Disney Princesses, then you will want to check out these fives apps. Kids can help their favorite Disney Princesses prepare for magical moments in this dress-up sticker book by changing outfits, accessories, and even adding tiaras. Pick from any one of the Princesses, including Cinderella, Ariel, Aurora, Snow White, Jasmine, Belle and Tiana, or take a picture using your iPad's camera and transform yourself into your own Disney Princess. Once you're done, you can send your picture to friends and family. This original classic Disney tale is brought to life through an app that includes a full retelling of the film with beautiful illustrations and original music from the movie. There are three ways to enjoy the story: you can read the story, follow along or use your own voice to record the story for future playback. There are also six interactive puzzles, six painting pages that you can color (includes glitter!) and a sing-a-along section with songs like "Bibbidi Bobbidi Boo”. With this iPad-only book app, you can follow the story of Belle and the Beast or record your own voice for later playback. There are also animated scenes that really bring the story alive and mini-games, like a maze where you help Belle find her way back to the castle or a hunt for hidden roses. 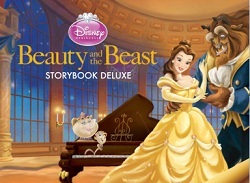 Storybook Deluxe comes with a Sing Along mode where you can enjoy songs from the movie. 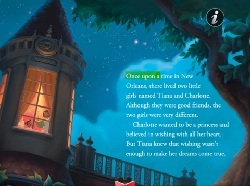 As with the Cinderella and Beauty and the Beast apps, there are three story modes (follow along, read at your own pace, or record you voice) for the Princess and the Frog app. As you read, you can interact with each page along the way by tapping certain objects or characters.This app also includes movie clips, coloring pages and mini-games based on the movie (escape the bayou by catching fireflies). Plus there's music that you can sing along to. 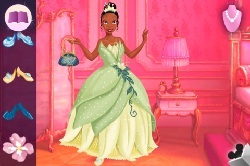 This app largely centers around Rapunzel, who you can follow on a brand-new original adventure. 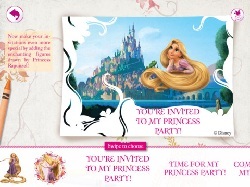 You can also create your own crown and bake Princess Cupcakes, create scenes with all the Disney Princesses and create and share invitations for your own party. You can also enjoy coloring pages with Rapunzel and all the Disney Princesses.